Ministry of Labour and Employment, Government of India has launched a health insurance scheme for BPL families which is called Rashtriya Swasthya Bima Yojana (RSBY). The beneficiary is anyone belonging to below poverty Line (BPL) family, whose information is included in the district BPL list prepared by the State government. Rashtriya Swasthya Bima Yojana provides cover for hospitalization expenses up to Rs. 30,000/- for a family of five on a floater basis. Transportation charges are also covered up to a maximum of Rs. 1,000/- with Rs. 100/- per visit. Beneficiaries need to pay Rs. 30 per family at the time of enrollment. Government pays the premium for RSBY. RSBY was launched in Uttar Pradesh on 1st of April 2008. In the first phase, 15 districts were covered namely, AmbedkarNagar, Azamgarh, Baghpat, Banda, Bijnore, Chitrakoot, Fatehpur, Gonda, Gorakhpur, Hamirpur, Jaunpur, Kanpur Nagar, Saharanpur, Sant Rabi Das Nagar and Sonebhadra. As of today, 945 private hospitals as well as 200 Government hospitals in 71 districts of the state are working in these districts under RSBY scheme. The Department of Rural Development is the Nodal agency for RSBY implementation in Uttar Pradesh. Commissioner, Rural Development is the Nodal Officer. ICICI Lombard, The Oriental Insurance co. Limited & United India Insurance are the Insurance Companies working under the RSBY scheme in Uttar Pradesh. 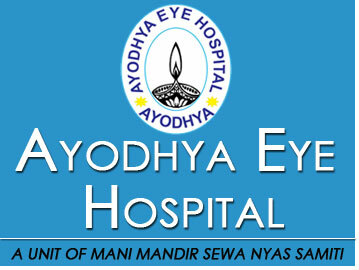 Capital Business Systems Ltd. New Delhi is the service provider for data conversion services From 19 April, 2010 Rashtriya Swasthya Bima Yojana is now smoothly functional at Ayodhya Eye Hospital for Comprehensive Eye Care Services. We take care of an average 300 to 400 outdoor patients of different districts in this hospital, so there is a separate RSBY help desk room to provide the registration process for smooth and effective treatment on first come first serve basis. Dedicated manpower makes the process easier and facilitates patients more effectively. During the financial year 2012-13, a total of 1,899 patients were examined and 1,356 surgeries were performed through BPL smart Card. 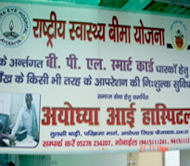 Beneficiary approaches the RSBY help desk Ayodhya Eye Hospital. AEH Help desk verifies that beneficiary has genuine card issued under RSBY (Key authentication). After verification a slip shall be printed giving the person's name, age and amount of insurance cover available. The beneficiary is then directed to a doctor for examination. Doctor issues the diagnostic sheet after examination specifying the problem, examination carried out and line of treatment prescribed. The beneficiary approaches the RSBY helpdesk along with the diagnostic sheet. 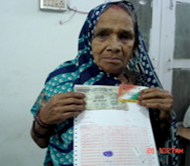 The help desk shall re-verify the card & the beneficiary and select the package under which treatment is to be carried out .Verification is to be done preferably using patient fingerprint, only in situations where it is not possible for patient to be verified, it can be done by any family member enrolled in the card. The treatment shall automatically block the corresponding amount on the card. In case during treatment, requirement is felt for extension of addition of package due to complication, the patient or any other family member would be verified for any required package selected. This would ensure that insurance company is apprised of change in claim. The availability of sufficient funds is also confirmed thereby avoiding such confusion at time of discharge. Thereafter, once the beneficiary is discharged, the beneficiary shall again approach the helpdesk with the discharge summary. After card & beneficiary verification, the discharge details shall be entered into the terminal & patient is provided with free medicines and transportation charges. In Case treatment of one family member is under way while the card is required for treatment of another member, the software shall consider if the insurance cover is available after deducting the amount blocked against package. Due to any reason if the Beneficiary dose not avail treatment at the hospital after the amount is blocked the RSBY helpdesk would need to unblock the amount.